As any Hollywood exec will attest, Joe Public is a tricky blighter to predict. Blockbusters with historical settings generally have as much mass box office appeal as Latvian character dramas, and those set on the high seas have historically sunk without a trace (see Roman Polanski's Pirates and Renny Harlin's Cutthroat Island; nobody else has). In 2003 however Disney found the box office treasure so many others had failed to locate when Pirates of the Caribbean: The Curse of the Black Pearl proved an unexpected global hit. 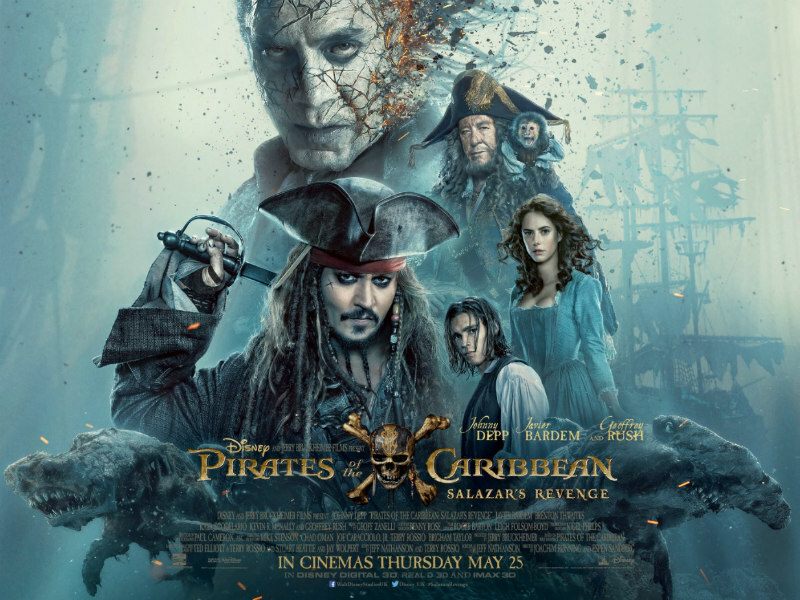 Everything suggested it would flop heavily - its premise seemed designed to alienate a modern audience; its biggest star was Johnny Depp, whose best years seemed long behind him at that point; and to the amusement of many observers it was a cinematic adaptation of a Disneyland attraction (see also Tomorrowland; nobody else has) - but audiences embraced it wholeheartedly, and now, 14 years later, we have a fourth sequel, Salazar's Revenge (released in the US under the far more appealing title Dead Men Tell No Tales). Following the recent Hollywood trend of burying talented actors under a performance stifling mix of CG and makeup (see also Oscar Isaac in X-Men: Apocalypse; nobody else could), Javier Bardem struggles to emote as Salazar, a Spanish Navy captain returned from the dead, along with the crew of his warship, and out for revenge on Johnny Depp's Jack Sparrow for a past indiscretion. Throw in another couple of subplots about estranged youngsters (Kaya Scodelario and Brenton Thwaites) attempting to locate their fathers while on the search for the mythical Trident of Poseidon, and we're all set for another slog through a franchise that wore out its welcome some time around the 130 minute mark of the first of its interminable installments. At 129 minutes, Salazar's Revenge is the briefest of the five movies in this series, and thankfully it's also the most well paced. Directors Joachim Ronning and Espen Sandberg (stunt cast for their work on the Oscar nominated Norwegian seafaring drama Kon-Tiki) keep things moving along at a whip, that is until the movie hits a giant wave and comes to a standstill during its obligatory overblown and overlong climactic set-piece. Where the series' original overseer Gore Verbinski drew influence from Rube Goldberg in the construction of his action sequences, Ronning and Sandberg invoke the spirit of Buster Keaton with some visually arresting set-pieces that will have the most jaded of viewers sitting upright in their seats. An early sequence begins as a play on For a Few Dollars More with an elaborate bank heist before entering '80s Jackie Chan territory with a wildly over the top chase sequence involving the bank itself being dragged through the streets of a Caribbean island. Keaton meets Leone once more in a mid movie setup that employs a camera fixed to a guillotine in a truly imaginative way. There's more visual invention in Salazar's Revenge than you'll probably see in the rest of this summer's would be blockbusters put together, but Ronning and Sandberg's inspired direction can't paper over the cracks of a lazy script that introduces a whole raft of new characters only to cast them aside in favour of the never more annoying antics of Depp's Sparrow, arguably the most irksome character to appear in a Hollywood franchise since Jar-Jar Binks. Much of the comedy revolves around Depp gurning, burping and falling over like a witless WC Fields, and a flashback revelation of his involvement in what amounts to an act of mass murder casts a giant shadow over Sparrow's cheeky chappy persona. While the Scandinavian directorial duo have brought a much needed freshness to Hollywood franchise filmmaking, their screenwriters have given us yet another by the numbers piece of soulless and formulaic storytelling. Pirates of the Caribbean: Salazar's Revenge is on Netflix UK now.